Ellsworth Adhesives is pleased to announce the successful launch of its new website. The newly developed site is now live and can be viewed by visiting http://www.ellsworth.com. The new website will provide features that fully ensure a benefit and service to customers. 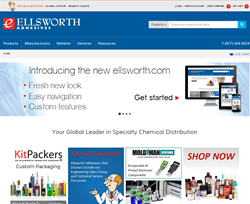 Ellsworth Adhesives, a global distributor of adhesives, specialty chemicals and dispensing equipment, is pleased to announce the successful launch of its new website. The newly developed site is now live and can be viewed by visiting http://www.ellsworth.com. One of the most notable changes to the Ellsworth Adhesives website is its brand new look - the appearance adheres to the Ellsworth Adhesives brand identity and presents a look that will enhance their established reputation as a global distributor. Content on the website has been updated and re-organized for a cleaner look and intuitive navigation so customers are able to find what they want quickly and easily. The new website offers improved search, mobile design, and saved product lists. The user friendly and engaging design encourages customers to interact with Ellsworth Adhesives by asking for application recommendations through the improved Ask the Glue Doctor® feature. The e-commerce portion focuses on highly personalized transactions and facilitates the purchasing experience with the ability to place tax exempt orders, view order history and verify order shipment updates. While the website has a great new look and new content, it retains original and popular features including the product comparison function, Live Chat and Request for Quote. The new Ellsworth Adhesives site is an excellent resource for users looking for information about adhesives and dispensing equipment. Visit the brand new website today at: http://www.ellsworth.com. Ellsworth Adhesives offers the world’s most comprehensive selection of products and services offering adhesives, sealants, coatings, encapsulants, tapes, releases and lubricants from leading manufacturers including 3M, Bostik, Dow Corning, Dymax, Emerson & Cuming, Fisnar, Henkel Loctite, Humiseal, Lord, Permabond, Sulzer, Techcon and many others. Ellsworth Adhesives has more than 50 Engineering Sales Representatives in North America and more than 150 Engineering Sales Representatives globally. Through their wide variety of value added services, they aim to fulfill adhesive needs, from initial technical advice through customized product fulfillment. Ellsworth Adhesives is an ISO 9001:2008 and AS9120:2002 registered company. Ellsworth Adhesives operates sales offices and warehouses in the United States, Canada, Mexico, United Kingdom, France, Spain, Germany, Sweden, Denmark, Brazil, Australia, China, Malaysia, India, Vietnam, and Thailand. Ellsworth Adhesives can be contacted directly at 1-800-888-0698 or by visiting http://www.ellsworth.com.